I remember during the presidential elections, when opponents were trying to disparage Michelle Obama, they put up a picture of her with an Afro. They also negatively portrayed she and President Obama’s fist bump in the same picture while clothing him in Muslim garb. (Don’t even get me started about diversity and religion, that’s a whole other series.) So, I could empathize with my niece in being cautious about going natural in today’s business world for I too was subjected to the playful jeers of being called “Florida Evans and Angela Davis.” I was even shown the traditional “black power fist ” (reminiscent of the Black Power movement) when I wore my hair natural. Surprisingly most of the comments were from my own family. If my family felt this way, what could I expect from a world still engulfed in issues of race, identity, and challenges accepting diversity and difference? So even though I’ve stopped chemically relaxing my hair, I’m still blow drying it straighter than it was before I relaxed it. What’s up with that? I’m still processing. What subconscious fears, messages, and memories are associated with the these figures that I was jokingly and condescendingly associated with? BTW. I see it as an honor to be associated with either of these two trailblazers and sheroes. According to an online biography, Esther Rolle (Florida Evans on Good Times) “Compelled to fight racial stereotypes, insisted before accepting the series that a strong father figure be central in the show (actor John Amos). She even left the show for a season protesting the negative role model perpetuated by Jimmie Walker’s jive-talking J.J. character. 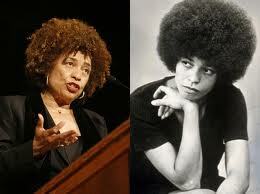 Angela Davis was indeed controversial, but must be admired for fighting for what she believed in. Today she is still fighting for justice by fighting against the prison industrial complex that has become today’s sanctioned form of human enslavement providing a steady supply of cheap prison labor for big business at the expense of rehabilitation. 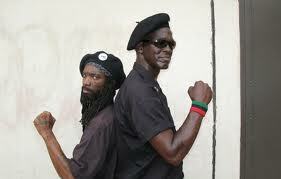 So let’s talk candidly about hair, militancy, and image. Do you think that some of our reactions to wearing our hair natural are subconscious fears from being associated with those who have been political targets , ostracized, and labeled as militant? And to those baby boomers who are not African American, what images do natural hair conjure? Please don’t just read and nod, share your opinions. ← Race and Hair: Do You Wear Your Hair Natural?